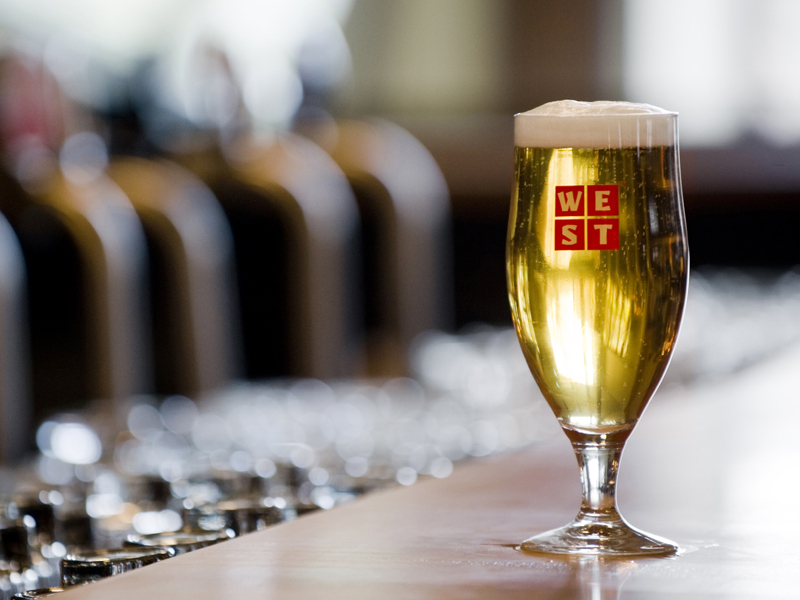 WEST is a Bavarian-style beer hall with a brewery attached that produces lagers and wheat beers brewed to the strict standards of the Reinheitsgebot. Scotland drew back from declaring independence from England in September and the two countries remain united by the fast-moving brewing revolution on both sides of the border. There are now 68 breweries in Scotland. They are watering a beer desert that for most of the second half of the 20th century was dominated by a duopoly content to foist abysmal interpretations of lager and ale on the long-suffering populace. A plan was born. Herbert was a successful businessman and he raised £1 million to set his daughter up as a brewer. The result is WEST, a Bavarian-style beer hall with a brewery attached that produces lagers and wheat beers brewed to the strict standards of the German Purity Law, the Reinheitsgebot. It’s a law that permits only malted grains, hops, yeast and water in beer-making and prohibits the use of cheap adjuncts such as rice and corn—a stricture honored more in the breach than the observance by most global lager producers. WEST has proved such a resounding success that Petra will soon be on the move. She has been given a £1.85 million grant by the Scottish government to build a stand-alone new brewery outside the city that will be capable of producing 42,000 barrels a year. She plans to open a second beer hall in Edinburgh, the Scottish capital, and doesn’t rule out a venture in London. Her bottled beers are on sale throughout what is still the United Kingdom. Tennent’s remains the biggest brewer in Scotland but its once deadly rival, Scottish & Newcastle, is long gone. S&N’s brewing operations are now owned by Heineken and its lone brewery in Scotland is Caledonian in Edinburgh. “The Caley,” as it’s known, produces the country’s leading ale, Deuchars IPA, which has won the supreme accolade of the Campaign for Real Ale’s (CAMRA) Champion Beer of Britain. Heineken, wisely, doesn’t tamper with success and even flies its executives from the Netherlands to see at first-hand what it calls “a proper little brewery,” with traditional mash tuns and kettles that are fired by direct flame. Scotland was once famous for such styles as Light and Heavy, the Scottish equivalents of Mild and Bitter in England, though maltier and less heavily hopped. But the arrival of a new breed of keen younger brewers has brought a dramatic change to the range of beers now available. Breweries stretch from the border with England to the far-flung islands of Orkney and Shetland, with new styles—including golden ales, IPAs, oak-aged beers, heather ales, porters and stouts—in the ascendancy. Fyne Ales is located in an idyllic setting, at the head of Loch Fyne and with densely-wooded hills rising in the background. It was founded in 2001 by Jonny and Tuggy Delap in a former milking parlor on their farm. They have had such success that their son Jamie, now in charge of brewing, is busily building a new plant that will produce 40 barrels a week. As well as producing traditional Heavies, the Delaps have won a fistful of prizes—including CAMRA’s Champion Golden Ale of Britain award in 2013—for Jarl, pronounced Yarl. The name comes from an old Norse word meaning earl and commemorates the invaders from Scandinavia who raided the area in the 12th century. Jarl (3.8%) has a massive blast of citrus on nose and palate, the result of using the American Citra hop. The intense gooseberry and lychee notes from the hops have helped turn the beer into the brewery’s biggest brand. The Delaps are not shy when it comes to using hops and their Superior IPA (7.1%) has four additions during the kettle boil. The packaged version is bottle fermented with live yeast. Whisky and beer are close cousins and it’s not surprising that several Scottish brewers have stressed the link by aging their beers in whisky barrels. Innis & Gunn in Edinburgh, founded by former Caledonian brewmaster Dougal Sharp, has been a pacesetter with its oak-aged beers that are widely available in North America. The signature of the beers has been the use of casks obtained from bourbon distillers in the United States but Sharp has built on his success by adding other beers aged in rum and Irish whiskey barrels. Haviestoun Brewery in Alva, in Scotland’s central belt, has also chalked up considerable success with its oak-aged beer but it has gone down a different route than Innis & Gunn. Instead of bourbon casks, it sources its containers from the Highland Park Distillery on Orkney, producer of some of Scotland’s finest single malt whiskies and which uses casks bought from the Spanish sherry industry. Brewmaster Stuart Cail fills the casks with Ola Dubh (8%) porter whose Gaelic name means Black Oil. There are three versions or—to use the whisky term—“expressions” of Ola Dubh, 12, 18 and 30, taken from the age of the whiskies previously in the casks. The beers have profound notes of oak, smoke, tannin, vanilla and honey that balance the coffee and hop character of the beer. Bruce and Scott Williams have built an international reputation for the beers produced at their Williams Brothers plant in Alloa. Their main claim to fame is Froach—pronounced “frook”—based on an ancient Gaelic recipe for heather ale. In common with the sahti beers made in the Nordic countries to the north of Scotland, where beer is filtered through juniper twigs, fresh heather is placed in the bottom of brewing vessels and the hopped wort or extract filters through the flowers prior to fermentation. The result is a beer with floral, earthy and minty notes. Digging deep into ancient brewery logs, the brothers have added such beers as Grozet, made with gooseberries, Ebulum with elderberries, Kelpie with seaweed and Nollaig brewed with spruce. An 11% version of Fraoch is aged in oak casks from the Auchtentoshan malt whisky distillery and has intense flavours of vanilla and sherry added to malt, heather and hop notes. The United States was the inspiration behind one of Scotland’s fastest-growing new breweries. Steve Stewart studied at Heriot-Watt’s International Centre for Brewing and Distilling in Edinburgh and then worked for Britain’s biggest brewer, Bass. But it was when he brewed at the Harpoon Brewery in Boston, with its acclaimed IPA, that he felt the urge to launch his own brewery. He opened a 10-barrel plant outside Edinburgh in 2004 and within a decade was forced to move to a new, custom-built complex employing 20 people. His beers are a mix of old and new and include Export—the Scottish interpretation of India Pale Ale—80 Shilling, another traditional style, and a heavily hopped Edinburgh Gold bursting with citrus notes from American varieties. Steve reaches out to drinkers with a smaller pilot plant called the Craft Beer Kitchen where both students at Heriot-Watt and beer lovers in general can turn up and fashion their own beers with the help of the brewing team. To date the kitchen has produced IPA, Hopricot (ale made with the addition of apricots), Popcorn Pilsner and a sour Berliner weisse wheat beer brewed with the addition of blackcurrants. Steve Stewart proves that brewing in Scotland today is not stuck in a time warp but offers an exhilarating magic carpet ride for beer lovers. Thanks for the comment. I suspect they may make more expressions for the American market than the UK one. I will check. Enjoy — they are memorable beers. Interesting that you opted to omit BrewDog from this article – especially given their pivotal role in the UK craft beer explosion. Guess you didn’t want to offend your CAMRA cronies, eh? !